IT might have been over four years ago, but I can still remember it like yesterday - Istanbul, the pinnacle of my time as a Liverpool FC fan. So much happened on that trip it's hard to know what to say (and what not to say). because putting something so big into words is no easy task. "Shock brought incoherence. Tony attempted to quantify the magnitude of what we had just seen. 'Well, your wedding didn't cause mass pain to thousands of Evertonians and Mancs,' Dave said. This was an ingredient to be relished, the sweet dusting on the Turkish delight. Rivaly brings such pleasure - and pain." Evans is the Football Editor at The Times, as well as a lifelong Red from Scotty Road. The book is about ticketless Tony's five-day train journey from Liverpool to Istanbul to watch the Reds' biggest game for 21 years. As you would expect it details the journey, and the match itself. But Far Foreign Land is much more than that. As Evans says early on, to truly tell the story of how he was feeling he had to refer to the past - and he does, warts an all. While there are laugh out loud moments, there are also dark - often avoided subjects - like Liverpool fans' role in the Heysel disaster. There's no attempt to glamourise or gloss over subjects, Evans just tells it how he saw it. The book is also an insight into the changing face of the game - how money, greed and globalisation has made football unrecognisable from the working class game with an image problem of the 70s and 80s. And that, as Evans details, has led to a new breed of fans - less concerned about loyalty and passion and more concerned about jester hats and face painting. Overall, this is no ordinary football book. No hooligan-sensationalism, one-eyed bigotry or fawning over players - just what it really means to be a Liverpool fan. As relevant now as four years ago - if not more so since the age of the Yanks - it's one of the best LFC books I have read. 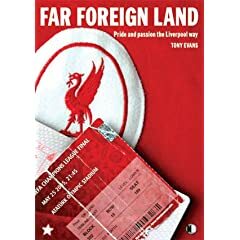 Far Foreign Land is £8.99 (for each sale £1 is donated to the Hillsborough Justice Campaign). You can buy the book here.